APDT Rally: Novice through Level Three Classes. Dates: Check the Calendar Page for new sessions. Email Anne to sign up for Rally classes. These classes are geared towards dogs brand new to the sport of Rally. 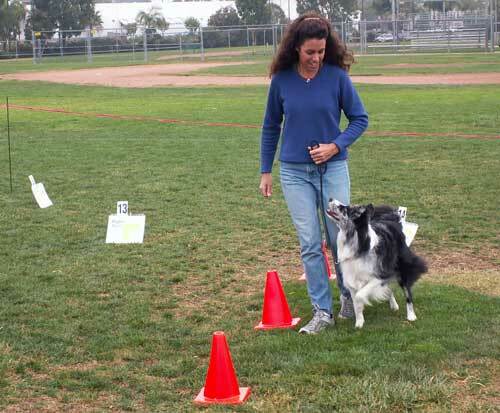 You will be taught the basics on how to get and maintain your dog’s attention span and focus on your cues, and you will learn the various skills within the Level 1 exercises such as heeling, turns, basic stays, the cone exercises, and changes of pace. This is a great class for anyone with a dog young or old, one who would like to practice and develop more obedience and attention with their dog, and a very fun way to spend an hour with that favorite canine in your life. This class is for dog and handler teams that have previously attended a session of Level 1 or Novice Rally classes and are ready to improve their skills. The goal of this class will be to refine your dog’s skills with the Level 1 Exercises, work off-leash if your dog is ready, and fine tune for Rally Trials if you ever want to show your dog. Level 2 exercises may be introduced, to prepare your dog for the higher level classes. This class is designed for dogs that have earned their Level 1 Novice title and are ready to begin working off-leash to learn the Level 2 and 3 Exercises. Dogs in this class should be able to work off-leash reliably, have a strong focus on their handler, and possess good skills in heeling, pivot turns, changes of pace, stays, take directions at a distance, and be able to jump obedience-style hurdles. You can participate in this class if you are working at the Advanced or Excellent AKC Rally level as well. We will be offering Level 3 classes at our May APDT Rally trial, so familiarize yourself and your dog with these new signs and skills. Your dog on a flat buckle collar (no prongs or choke chains please) and a leash. An Easy-Walk or Sense-ible harness is fine, a Gentle Leader headcollar is acceptable as well. Many, many yummy meaty treats that your dog will go nuts for: Natural Balance, lunch meat, tri-tip, steak, grilled chicken, etc. Bowl and water, shade, chair for yourself, bags to clean up after your dog with. Any toys that motivate your dog. A crate or pen to contain your dog while you walk the courses. We also offer AKC Rally Obedience Classes from time to time as well. Open to dogs who have completed an AKC or APDT Novice Rally class session in the past, and for dogs currently competing at the Open or Excellent levels in AKC Rally, or in Levels 2 or 3 in APDT Rally. Weeks 1-3 will focus on the Advanced AKC Rally signs and skills, and we will practice and learn all of the exercises and work the dogs on sequences and courses. Weeks 4-6 will focus primarily on the Excellent signs and skills and then put them all together to work sequences and courses. This is primarily an off-leash class, so your dog’s off-leash skills, solid heel-work, and a great recall are required. The emphasis will be on skill building while maintaining your dog’s attention and enthusiasm and having fun! This is an introductory class for dogs new to the sport of Rally Obedience and also for dogs who have done Novice Rally (AKC or APDT) and want to improve your skills. This class is on-leash, you will be taught the basics on how to get and maintain your dog’s attention span and focus on your cues and you will learn the various skills within the Level 1 exercises such as heeling, turns, basic stays, the cone exercises and changes of pace. This is a great class for anyone with a dog, young or old, who would like to practice and develop more obedience and attention with their dog and a very fun way to spend an hour with that favorite canine in your life. You will need to bring with you: leash and a collar (or a front-clip harness or Gentle Leader is fine as well), really delicious awesome meaty treats for your dogs, water and a bowl, and a crate or pen for your dog while you walk the sequences/courses, a chair for yourself and a clicker.